So this interview was actually little less then a year ago but do to things changing in my life I never posted it...but here it is at last! A huge thank you to Stathis Athanasiou for spending the time to do this with me. Since the interview A received full funding from indiegogo.com and has plans to be released for free soon! Which is awesome, great job guys! To find out more about Stathis and the incredible crew behind A check out their website HERE. How did you guys get started in Film Making? ( I'll be answering about myself on this) I found myself grabbing a camera and an editing program back in the late 90's and realizing that "hey, I understand this!". So I quit university -I was one step from getting my diploma in Medicine- and went out to be a director. For a while I was working as an editor, and very early I started making short films, that attracted attention in international film festivals, so I got directing jobs in Greece. From that point on I was working in advertising, making money, and making short films, spending the money I earned in my "day job". At the same time I was working in the theater, which I still am, and it was like this. Ad making money, short film costing money. When I did my first feature film "DOS | a love story, in reverse…" I knew I couldn't go back and the only way ahead was cinema. No distractions! Is there any specific film maker that has influenced the way you guys make and present your films? The main artistic team which is comprised of Michael Samiotis (production designer), Michael Kloukinas (photographer), Stavros Gasparatos (composer), Serafita Grigoriadou (actress), Theo Abazis (composer) and myself, all have different tastes, but I would say where we all agree the most is in Theo Angelopoulos' first three films, Andrei Tarkofsky, Luis Buñuel, Terry Gilliam, David Lynch, La Haine (we all adore La Haine), we collectively despise Robert Bresson, and we love Roy Anderson. Everything we see and like influences us, films, books, paintings, theater, newspapers and it couldn't be otherwise.With that said, I really can't say we are consciously being influenced by anything other than our own moment of inspiration that comes unexpectedly and lands on our bodies when we least expect it. For me personally I would say what influences me the most, are my collaborators. Whos idea was it for the movie and how did the idea come about? The idea was mine, after reading a short story by one of Greece's best writers of the past century, Ilias Venezis. In this short story, there was a woman sitting beneath a tree where the Nazis had hung her brother and wouldn't let her bury him. This image of a woman waiting below a hanged man stuck to me and I immediately knew what I wanted to do next. It took me over 6 months to write a "zero" draft, but after that when I found this something that was the essence of the story and started working on it with the team, things moved on quite fast. Nevertheless we have been working on this idea and this film for almost two years now in total. What is Alpha for those who don't know about it? Alpha is the first letter of the alphabet. Alpha is the beginning. Alpha can be whatever you want. Anonymous, angel, agony, air, anarchy, antidote, just some of the hundreds of Greek words that begin with "A" and can have a correlation with our Alpha. In short, let's say that "A" stands for Antigone, since the core of the story is inspired by the ancient myth of Antigone and her clash with the unjust authority. But the main idea with this project is to start an artistic and a literal conversation, so we, as filmmakers, make a movie about Alpha and at the same time we invite other artists to give their interpretation of Alpha and its relevance today, in our everyday lives. So Alpha is an open call to a discussion for artists and audience alike, so we can get together and communicate in order to see what it looks and feels like to be living in a time of change, in a time of crisis and of hope. You guys won a long list of awards for DOS, including The New York Independent Film Festival Best Feature Film. 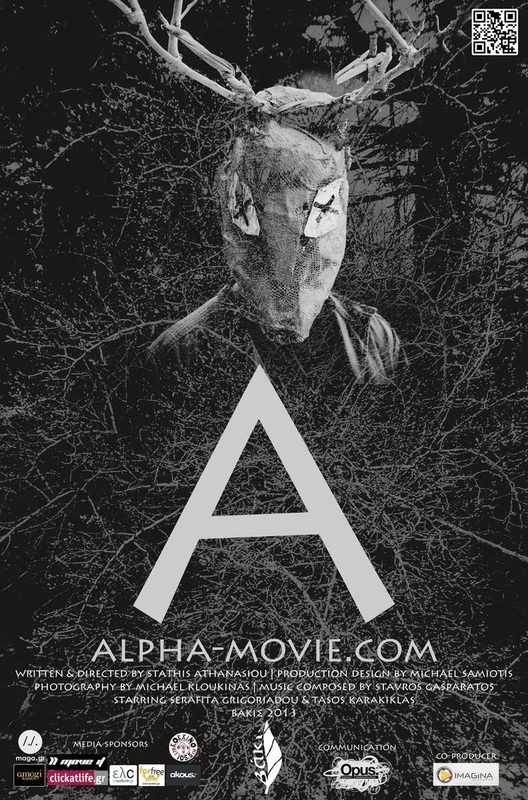 How big was that to you all and how will Alpha differ from your last film other then the story? It was a great moment to step out of the sound studio with DOS and immediately land in New York. And not only that, but win two important awards on top! I can't really put into words how much I loved New York and how much I learned from this trip. It was actually the foundation for what we are doing now with Alpha, because it was there where I started learning about all the great and innovative ways the independent filmmakers in the States are discovering, in order not to get crunched by the "industry" and in order to find their audience one by one if possible. To create personal bonds and have direct communication between the creators and the people. So after that trip my whole perspective as to how cinema should be done in our time, totally changed. I already knew I didn't want to follow the rules of a system that was conceived more than a hundred years ago, and that even the ones running it now, know it's finished (I am talking about the traditional distribution model), but I didn't now how to do it. Getting in touch with American colleagues and researching, started giving me ideas about how it can be done. And of course I am not alone, as the whole team is pushing the direction in which we are moving in even more crazy and radical paths! How important was it to portray the politics of the film through the conflicts that the brother and sister face in the film? You need to know a few things about Greece in order to fully understand why we are making this movie now and in this manner. Greece is suffering one of its biggest social crises of its modern history. Because of the financial crisis, a deep social crisis has erupted that was lurking underneath for many decades now, even centuries I dare to say, and now it is all on the front page and in our face. We have a Nazi party (yes, Nazi, not far-right, Nazi) that is currently the third party in Parliament (!) and keeps rising in polls. Our government is not Nazi, but is as Orwellesque as it can get. And at the same time people lose their jobs, taxes rise like crazy, while salaries drop to third world levels. As you can imagine we live in a chaos where violence is ever present as all demonstrators are being smashed by riot police in manners that even third world countries wouldn't approve. In a few words, the situation is boiling. People are paralyzed because of fear inspired by our "saviors" and succumb to the paranoid demands imposed by the authorities. This situation yells "Antigone" to someone who knows our history and our culture. Antigone wouldn't obey to the irrational demand set by King Creon, and willingly lost her life because she did her moral duty. In our story, Alpha is the exact opposite of Antigone, she is a conformed bourgeois living by the book. When trouble finds her because of her brother, who "crossed the line", she will have to confront what she has been hiding from. Her personal sense of justice and her personal responsibility to do something about it. And this is the situation with everyone in Greece. We are being challenged by an unjust authority to comply with their irrational demands that debase our lives and our dreams. In ancient Greece, those who did not actively participate in the matters of the city and were living their private lives were called IDIOTES. I think you can tell which word you have in English for that. So the movie is about the birth of Antigone, the birth of an active citizen and the death of an idiot. If you could give one piece of advice to the audience while they watch your film what would it be? The same advice I give anyone when watching our work. Leave your mind at the door. The analytical process of the mind, the thinking mind, is something that needs to be left out when we face art, because art is not speaking to this part of ourselves. It speaks to our soul directly in ways that cannot be put into words, nor into rational patterns of thought. It is like dreams. You can't put dreams into words and if you do it, it will never feel the same as when you were experiencing the dream. It is a different process and we need to let ourselves go if we are to get something from art. How is the way you guys are bringing the film to the viewers different then anyone else? Since we are making a movie to criticize the current system, it wouldn't be honest if we left it at that and didn't do something to criticize the way our field works. Cinema, distributors, the "industry", is an outdated system that was built in a different time (actually more than a century ago) and keeps going because of inertia and because of the few people and companies that still profit from it, while at the same time everyone else is just eaten alive. We can't do anything to confront this system since no matter how hurt it now is, it still is huge. What we can do is bypass it and construct a new and alternative way to tell our story to the people. What so many independent filmmakers are actually doing in the States, and so successfully might I add, so what is now called "alternative", will definitely become "mainstream" in a few years. So what we do is: first of all we take the movie with its live orchestra to the place that was originally constructed to host the different adaptations of the myths. The Theater. What we now call, the Ancient Theater. So we present the movie and its orchestra in Ancient Theaters of the Mediterranean and we bring cinema to its ancient roots. In the cities, we go to Art & Cultural Spaces and Alternative Venues where we not only bring the movie with its orchestra, but we organize parallel exhibitions of many other art forms (photography, fine art, sculpture, video art, viral etc.) so other artists can give their interpretation of what it means to read the myth of Antigone today and how this reflects on our lives. And for the spectator not to be left as a passive receiver of information , we organize daily meetings under the same roof, where an important guest presents a subject and we all talk about it. As I said before, the main idea is to make the cinema an excuse, an igniting factor to fire up an artistic and literal conversation for the things that matter to us now. What are your thoughts on crowd sourcing and how much has it helped with the productions of your films? It is the best thing that could happen to all of us independent creators, since not only can we find financing for our works, it also brings us in direct contact with our audience. Direct contact, no intermediates, financing, what more can you ask for? Well… I could ask for one thing I guess, for it to be less stressful, but I guess you can't have it all. This is the first time we use crowd-funding for any of our works, in fact this is the very first ever crowd-funding campaign in Greece for a feature film and in such a scale. So we not only need to promote the project, we need to educate the people as to what this strange new term means and why is it something we should all be aware of. For this we are touring the country organizing presentations and parties, so we can get together and explain what exactly we are doing. It's a lot of work but it's worth it! Do you see any major changes in technology that will effect films 10 years down the road? The advances in technology are so fast that any prediction is bound to be outdated the moment it gets made. If I could say one thing, I would say that cameras will evolve like photo cameras, meaning more and more resolution for less and less money, which is great. I only wish they could agree on a couple of standards so it wouldn't be so fragmented out there. What has been the best part of making Alpha? The best part is yet to come. Making the actual movie! We start in May, so get back to me after that and I'll tell you then!